When many people think about healthy living, the topic of weight regularly comes up. Maintaining a healthy weight, however, can be a struggle for some people even if you know that you need to lose a few pounds. Why is maintaining a healthy weight so important? Along with feeling better and having more confidence, maintaining a healthy weight can relieve excess stress on your heart, reduce cholesterol, and alleviate additional stress on your weight-bearing joints. You can live a more fulfilling, healthy life if you tackle weight loss in a healthy and reasonable manner. While it may sound easy to lose weight and change your life overnight, we understand that losing weight is a long-term commitment to your health. In addition, specific groups of people seem to struggle with this challenge more than others. If you have a health concern or restriction, exercising to compliment your diet can be difficult. There is one group of individuals in particular that seem to truly struggle with weight loss: moms. For a variety of reasons, many mothers find it hard to drop weight and lose weight when they want to the most. But this doesn’t have to be the case. When it comes to tips for healthy living, here at the Harmony Company we’re focused on your health and how we can help you continually improve. Why do moms struggle to lose weight? There are a variety of reasons why moms in particular struggle to lose weight when they make an effort to do so. It’s not that a mom’s body is less capable of shedding the pounds than anyone else, but the lifestyle factors involved with being a caretaker that make it more difficult to focus on personal needs. Most of the struggle to find time to focus on both diet and exercise can fall into two categories: a lack of time and confusing nutrition guidelines. Whether you’re a working mom or a stay-at-home mom, you probably feel like there is very little time in the day left for your own self-care, let alone a long workout. What little time you get to exercise needs to be as effective and short as possible in order to be able to stick to a regular routine. No matter how full your schedule gets, making time to exercise is exceptionally important for long term health. 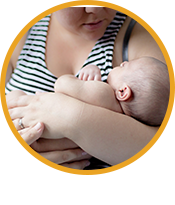 The second big struggle for many moms is how difficult and confusing it can be to get proper nutrition. With so many different recommendations in terms of calories, portions, and overall nutritional needs, it can quickly become a frustrating dilemma. Between all the conflicting “should” and “should nots,” it’s easy to get lost with your nutrition goals and not know how to address your weight loss in a healthy and meaningful way. Learn more about the pros and cons of certain diets in our previous blog for guidance on the best nutrition plan for your needs. What can you do to lose weight and live healthier? With these challenges facing moms, it’s no wonder that many moms struggle to lose the weight that they want to in order to look and feel better. Even though these challenges may seem frustrating and difficult to get around, there are a few things that you can do in order to help tackle your weight loss needs. When it comes to confusing and conflicting nutritional information, get to the root of the problem by seeing a registered nutritionist. Talking to a nutritionist about your personal goals and the needs of your family can help you to come up with a plan that you can stick to. Understanding the number of calories you need, what macros you should be aiming for, and how you can achieve this are all things that a nutritionist can help you to plan out. In addition, a nutritionist can help you figure out good meal options for even the pickiest of eaters in your family, while still adhering to your nutritional needs. A nutritionist may not be the only professional that you seek help from. 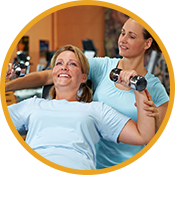 A personal trainer can help you to refine your workouts and help you get the best results in the least amount of time. Whether it’s a personal trainer at your local gym or an online trainer that helps you structure your workouts, the professional help can’t hurt. In addition to working with professionals, you can help improve your workout routine yourself by challenging yourself to be consistent about your workout routine for 30 days. Studies have found that in order to make meaningful change in your life, you need to intentionally tackle the challenge ahead of you consistently for 30 days. This 30 day window helps you to create a new routine and allows you to continue with ease once these 30 days are up. There are plenty of mom groups available to let kids play, but how many are dedicated to helping you get a workout? Grab one of your friends and head to the gym. Having a workout buddy is a great way to hold one another accountable for going on a regular basis, and it can help you to stay positive throughout the entire process. In addition, consider picking a gym that has child care, making it easier for you to get in a workout without having to worry about finding child care at a moment’s notice. There are many benefits to taking the time to lose weight. Not only will you feel better, but you’ll look better and have more energy as well. Making meaningful lifestyle changes with both diet and exercise are the main steps in order to achieve weight loss in a healthy manner. Moms shouldn’t be excluded from these steps towards a better lifestyle simply because they struggle to find time or have to manage the whole family’s nutrition needs. Take the steps that you need to in order to live a healthier, more fulfilling life as a mom.